Both yarns were spun from the same fiber: Frabjous Fibers BFL roving in the Balsam colorway. Both even use the same number of plies: 3. But the similarities end there. Spun: On a drop spindle. This was one of my first spinning projects. Storage: The yarn was wound off my spindle into 3 center-pull balls. And then it sat for three or four months. Plying: A few months after I acquired my first spinning wheel, I decided to try plying the three balls together. Color: We see a pretty even color blend. Comments: The whole thing looks a little bit…chewed upon. Textured and inconsistent. Not surprising given my inexperience. Spun: Last week on my Lendrum. Storage: None to speak of. It just finished drying. Color: We see more stripyness and less blending due to the plying method used. It also looks like the colors of the earlier hank are a bit darker overall. The hanks are not from the same dye lot so this is possible. Comments: It doesn’t look like a velociraptor had its way with it. A lot smoother and more consistent. Wow, that is an interesting difference. Makes me eager to see how my spinning changes on a wheel. I agree that the wheel spun yarn looks smoother, but I love the personality of the spindle spun yarn. I like them both. That’s an amazing difference – not unexpected I suppose, given the different use of tools. However, I wouldn’t have expected such a difference. Both lovely I might add! 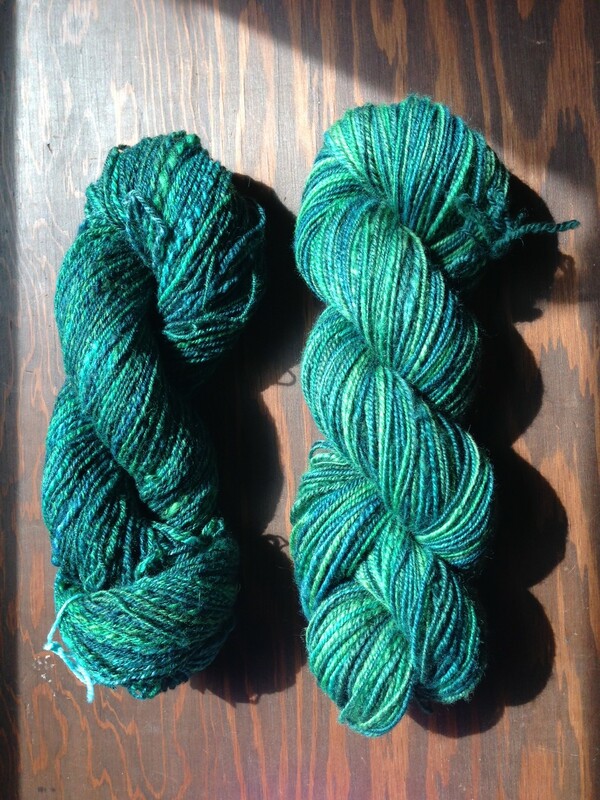 They’re both beautiful, but I do like the slubby texture of the left one – like Noro! Beautiful. The little bit of spinning I have done, on a spindle, also looks like it has had a run-in with a velociraptor. The one on the right looks perfect! That’s a very fine idea. I’ll keep it in mind. Stripes in general sounds like a good idea. Q – Love the comparisons, great descriptions of technique and pictures. Thanks! I am new to spinning and trying to keep good notes for over time. I like both skeins. Love the comparison.